My early childhood classes usually had some lessons related to food and household items during November. Pizza was one topic that I often used as I really like the book, Hi, Pizza Man!, by Virginia Walter. Much language was elicited as the students used props to retell the story. Retell the story, Hi Pizza Man!, while using ideas from Flannel Friday: Hi, Pizza Man! found at 1234 More Storytimes' blog. Get some props; a telephone, toy or paper pizzas, and a hat for the pizza man. Tell the students to call the pizza man to request a pizza. They can request sizes, toppings, etc. The group creates the pizza and the pizza man delivers. There are a lot of great pizza related activities online. And, many literature selections suitable for the pizza theme. 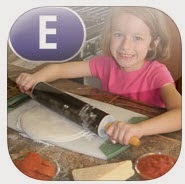 I like the FREE app, Making Pizza - LAZ Reader [Level E–first grade] by Language Technologies, Inc. The pictures are wonderful and the book provides a lot of opportunities to talk about actions and ask questions. NYC Department of Education has an adapted PowerPoint Book, I Love Pizza, as well as, printable books made with Widget Symbols. Find more than 25 FREE pizza themed books at Tar Heel Reader.org. Activities to go with the book, The Little Red Hen Makes a Pizza, by Philemon Sturges and Amy Walrod can be found at Make Learning Fun.com. You will also find an emergent reader and pizza sequence cards. More sequence cards, How to Make Pizza, can be found at Kizclub.com. Sing pizza songs to teach imitation of gestures, vocabulary, sentence structure, following directions and phonemic awareness. Find three cute songs at Storytime Katie. At Boardmaker Achieve there are over 50 printable or interactive Boardmaker activities. Find recipes, storyboards for popular children's literature, sequence cards, a pizza restaurant choice board, and several good interactive pizza activities for your whiteboard. For those of you who like to cook, check out Play With Your Food: Pizza Fun Faces at Early Activities and Projects. Find more recipes at Preschool Express. Watch Sesame Street's Fat Blue orders from Speedy Pizza. Talking about this would be a good question and answer activity with some phonemic awareness and inferences thrown in! Video clips emphasizing the word pizza can be seen at Sesame Street.org. Use these for print awareness, phonemic awareness, and the phoneme /p/. Look for Ordering a Pizza, Pizza, and P: Pizza. Another phonemic awareness activity, Word World's Pigs Perfect Pizza, can be found at PBS Kids.org. Make pizza at Emily's Pizza Parlor by Inkless Tales. Over 150 pizza activities at Teachers Pay Teachers are FREE. Pizza Scramble- A free Auditory Processing, Sequencing, and Memory Activity and It's a PIZZA were created by SLPs and cover sequencing, following directions, recalling sentences and more. Thank you! Love your site and all the resources you offer! Thanks so much! I enjoy sharing it.